There appears to happen with different kinds of people with different personal interests and diverse schools of thought when political freedom is placed on the table of discourse. While some may be supportive of political freedom, some are unfluctuating in the opposition, whereas others maintain neutrality. They may be found among the high social class, the medium and the low social class. Some who are in opposition to political freedom of their people, if they are the elites, may be acting based on their school of thought, understanding, insights, futuristic conjectures and predictions, while majority of elites opposing and boycotting their political freedom do so out of selfish interests. In the struggle for freedom, like Biafra, different people serve the parts that favour them most. The probability of finding unflinching opposers of political freedom as it is sought by the Indigenous People of Biafra, today, tends to increase to unity when you navigate from the clusters of poor masses to the bunches of elites, mostly those holding political offices in the government of the day. 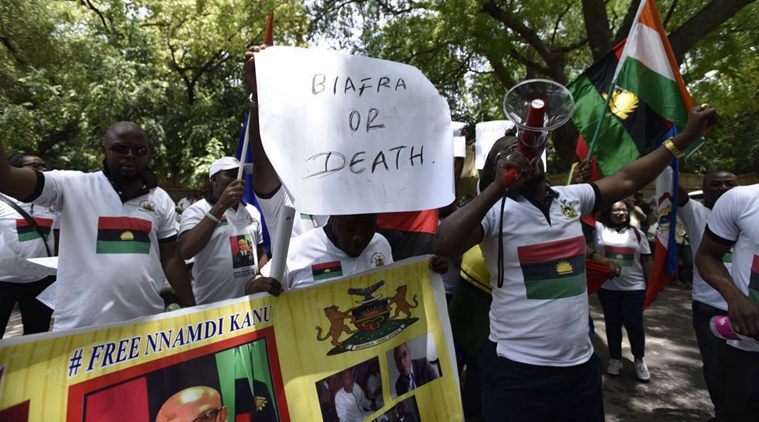 In the fight or struggle for freedom, it is true that the group(s) leading the campaign for self-determination or secession should not neglect the elites of the land but at the same time, I must opine that IPOB should not allow themselves become demoralised by the vehement opposers of the the will of the masses because many of the elites serve their stomach infrastructures. I want ALL Biafran Activists, who are determined to restore the land of Biafra which was re-annexed to Nigeria in 1970 after a bloody civil war, to understand that history teaches that they should not expect all the elites in Biafra to support the agitation for a Biafran state. Expecting all states' governors in Biafra territories, senators from Biafra and prominent politicians from Biafran land to support the struggle for political freedom from the Nigerian state is an unrealizable dream that may be detrimental to the resolve for a Biafran state. I want all who agree with the school of thought of Rev. Ejike Mbaka, who said that he would only come out to support the struggle for Biafra when the elites have come out, to change their mind. I want Biafrans to know that freedom fighters that fought for the freedom of their nations were not fully supported by their fellow countrymen instead some of their countrymen joined forces with their oppressors to fight them. In the time of the American Revolutionary War against Britain, the Tories who were American citizens that were loyal to the government of Britain, joined the British soldiers to fight against their countrymen. Despite the actions of the Tories (Loyalists), the Patriots ( also known as Revolutionaries, Rebel) were bent on achieving independence for the Americans and they eventually did. In a country like Nigeria where lawlessness abides, the susceptibility to attacks from the government and governmental agencies on politicians who tend to be Biafran Patriots becomes a major factor to determine the influx of support to the Biafran struggle. But even in a British-America where comparatively high civicism abode, there proved to be fewer supporters of American freedom among the thirteen colonies that later constituted United States of America. Although no one can be certain of the number of Americans who supported Britain, according to the thoughts of John Adams, the Massachusetts political leader, 33% of Americans supported Britain's rule over America and 33% of Americans maintained a neutral position. About thirty thousand Americans turned British soldiers and fought for Great Britain. The Biafran Activists should not expect those appointed by Hausa-Fulani into political offices either in Biafra or the wider Nigeria, to work against the decision of their pay-masters, which is to keep Biafrans in perpetual servitude. Neither should they expect ALL with huge business and monetary benefits in Hausa-Fulani and Yoruba lands support the idea of freedom, because considerable number of Loyalists in the American Revolutionary War were more of Americans who benefited from the king, and those who had business connections in Britain. People tend to work for the interests that serve them most. It is on record that Benjamin Franklin who signed the American Independence Declaration was opposed by his son, William, who was the governor of the colony of New Jersey. The son was protecting the interest that served him most. Likewise, other persons and countries that fought during the war. Although some were joining the winning side at some points but the whole thing was interest-based. Indians were supporting Britain because they wanted Americans to exit their lands. Most African-Americans were supporting the Patriots because they would benefit more in an independent America. But should one always work for his personal interest or should a group of elites work for their selfish interests and not the interest of the people they claim to represent or speak for? When one looks at the unfortunate state Biafrans are in, is it not better for the elites to work to free their people? When we put side by side the reasons why Biafrans want to be freed from Nigeria's occupation of their land, and the reasons why Americans revolted against British rule, it is only reasonable to think that Biafrans should have exceeded their elastic limits in Nigeria. But that is a thought for another day. Now, if the elites from Biafra remain hell-bent on serving their selfish interests and their masters' interests, to the detriment of the Biafran people, I take it that they are serving the interests that appeal most to their selfish lucre. Example of the fact that people will always support the part that favours them most is corroborated by the reactions of the governors, politicians and the so-called leaders of thoughts from the south-south and south-east geo-political zones and I am saying that Biafrans should not be deterred by such oppositions because a struggle for freedom that is not confronted with such height of sabotage is not worth fighting. Freedom is taken in most cases, and a country like Nigeria that is surrounded by many vested interests is not expected to give freedom to its subjects without a fight, hence the contrary opinions of the elites, be it governors, kings of the land or Ohaneze Ndi-Igbo should be seen as a necessary fight that must take place to make Biafra worthwhile. Whether few or none of the elites from Biafra support the Biafra Republic, I believe Biafra will eventually come. It is a matter of time. But I want to urge everyone to take a leaf from the American Revolutionary War against Britain where some Americans thought that staying under Britain would benefit them more than being independent of Britain hence they helped Britain to fight their fellow countrymen - just as some people from Biafra support the continued existence of a failed Nigeria because they feel that Nigeria, if kept faith with a longer while, would turn to the paradise they have always dreamt of or if Nigeria continues to exist, they (elites) are sure of looting more public funds to secure more assets abroad for their generations unborn, as against Biafra where there may be no such opportunity; or the thought that Biafra will fail just like Nigeria. But the Patriots of America have proven the Loyalists of Britain wrong because America is one of the most powerful countries in the world and it couldn't have been this great had it remained under the apron strings of Britain. Therefore, the door of support is open and everyone should re-consider which part favours the people of Biafra; which part guarantees greatness for Biafra; which part will facilitate the development of the potentials, talents and ingenuity in Biafrans; which part will guarantee safety for Biafrans from the blood-thirsty Hausa-Fulani with their religious fanaticism; which part is more honourable and fulfilling. Everyone should quit personal interest and face the masses' interest. And it is my prayer that the elites from Biafra will discover that Biafra is the only part that will guarantee all of the above and even much more - including equity and justice which Nigeria can not give to Biafrans. That notwithstanding, the IPOBs should fight the fight of Biafra bearing in mind that not all the elites are freedom fighters and should not ALL be expected to join the struggle before victory is assure rather most of them must fight to protect their personal interests. And IPOBs should remind themselves that the Biafran struggle has reached this point of no return with little or no contribution from the elites. Finally, let all who believe in Biafra continue to put more efforts against all odds, because by so doing Biafrans will get to their Promised land of the Rising Sun. Shalom!! !